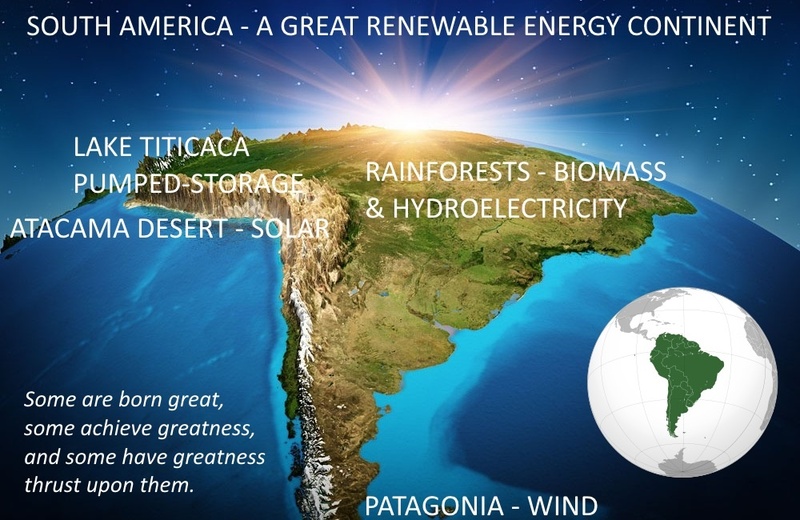 Transitioning to a fully renewable energy system would be the cheapest option for South America and it is possible in the next 15 years. As an ever-present accomplice to South America’s dramatic scenery, heavy sunlight could also be the dominant source of energy for the region by 2030, according to a new study from Finnish Lappeenranta University of Technology (LUT) and VTT Technical Research Centre of Finland. But this is not the only clean energy source that the region should adopt, as the study finds that a 100% renewable energy system, including numerous renewable technologies, would be the cheapest energy system option for the region, due to its rich solar, wind and hydro resources. LUT and VTT Technical Research Centre of Finland have undertaken a number of similar studies, funded by the Finnish Funding Agency for Innovation as part of the Neo-Carbon Energy research initiative, but found that South America has a number of advantages for renewable energy adoption. The study found that these competitive advantages over other parts of the world mean that developing a 100% renewable energy system is not only the cheapest option, but that it is also achievable by 2030. The advantages come in the form of solar, wind, and hydro resources, which means that only few energy storages would be needed in a renewable energy system, while hydro dams could even be used as virtual batteries for solar and wind electricity storage. The study looked at the costs for electricity in a 100% renewable energy system in South America, and found that it would range between EUR 47 to 62 per MWh, while other options, including new nuclear and carbon capture and storage, would cost between 75-150% higher for the electricity. Interestingly, the renewable energy source that would come out on top in this forecasted system is solar PV, by quite some way. In fact, the study forecasted that solar PV would make up 415 GW of the 688 GW required for a 100% renewable system, which is approximately 60%, and significantly higher than hydro dams that would make up 144GW, and wind that would account for 69 GW. Asset rich and Financially very poor. I would expect that the smart money should go there set up manufacturing bases and expend money to provide power from zero energy inputs and provide employment to the people who would love to get a job in a company that would raise their standard of living let alone the benefits to the country in tax returns. The only problem is the distance from large consumers now that is a problem. Distance is not a problem if the energy can be shipped from South America as fuel. Biomass can be shipped as it comes and solar, hydro and wind energy can be used to synthesise renewable fuels, some of which tankers can ship almost as easily as oil. In future, a global energy grid could be another option.